Presented by VeteransBenefitsGIBill.com, your guide to The Post 9/11 GI Bill. For generations, fishing has been a favorite American pastime and one of our most well-loved sports. Perhaps one of the main reasons why fishing is so beloved by millions of Americans is due to its versatility. Fishing can be as relaxing or as exhilarating as you want it to be. You can spend the day at a local lake or pond relaxing or enjoy an exciting day on a bass fishing boat. As long as there’s a body of water, be it a lake, stream, river or ocean, there’s fishing to be had. However, any seasoned fisherman will tell you that fishing isn’t as easy as it looks. There are many techniques and strategies involved in catching fish (and especially big fish) and you’ll need the right tackle and equipment to get the most out of your fishing expeditions. To help your efforts, our team has selected the top fishing blogs to bring to you the very best in tips and tricks on becoming a fishing pro. From learning how to tie knots, to the best local haunts, to what color lure you’ll need to reel in a monster, these blogs have all the bases covered. We are happy to award badges to each of the bloggers that made the grade, and we encourage you to share our list of blogs with others who also enjoy this incredible sport. Congratulations to the bloggers that made the list and happy fishing! Went to Sungai Kayu yesterday with Jepp. Tried to catch talapia, snakehead and prawn but unluckily there were none of them. 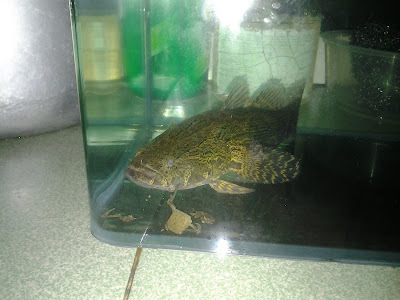 I only managed to catch a Marbled Goby which is quite small and two anabas testudineus ( ikan puyu/ karuk ). All of them were given to Jepp to keep in his aquarium. No picture was taken during the 'adventure' as it was raining.